How to wear beige? It’s not always the most easiest color to style or to wear. 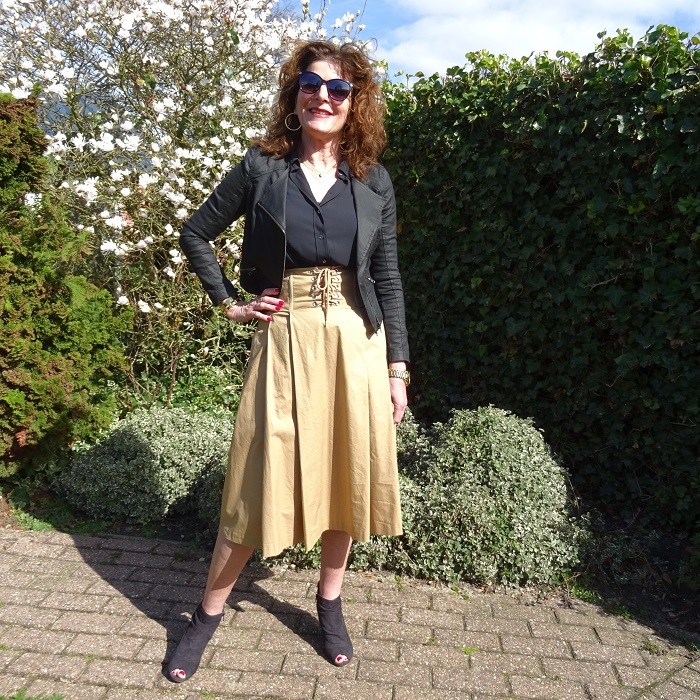 In last weeks post I wore a monochrome beige outfit. 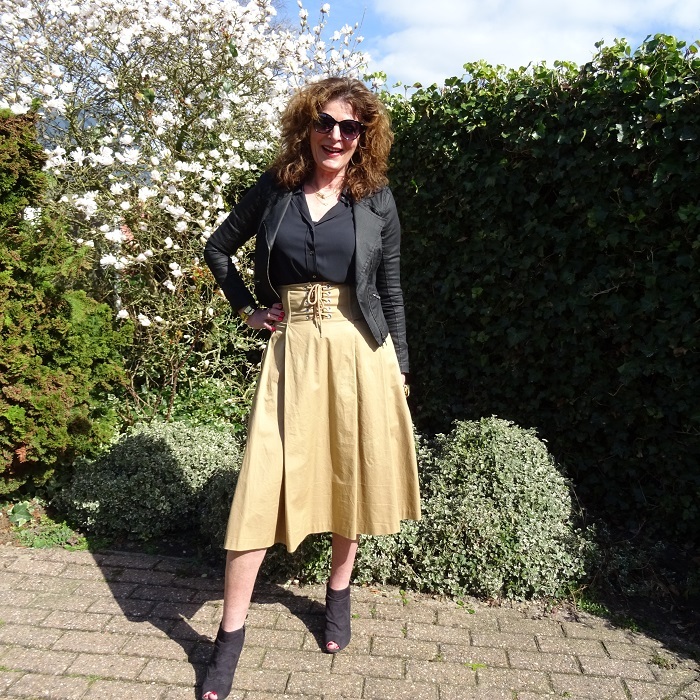 Now I style a beige clock skirt with black. Don’t mind my terribly white legs. But I was so happy that I could finally go outside without a pair of tights! I’m really done with tights now. But it was only 11 degrees, so actually too cold. But the sun was shining so well, and then you think it’s much warmer then it really is. This skirt is made of cotton and many women really like that, not me. Just like linen, I think it is too much wrinkling and to stiff. I prefer flexible soft fabrics. But this skirt has the big advantage of pockets, why do we always like that so much? And I think the lacing is very nice. The skirt is also very high waisted and I think that looks good with skirts. Only with skirts! 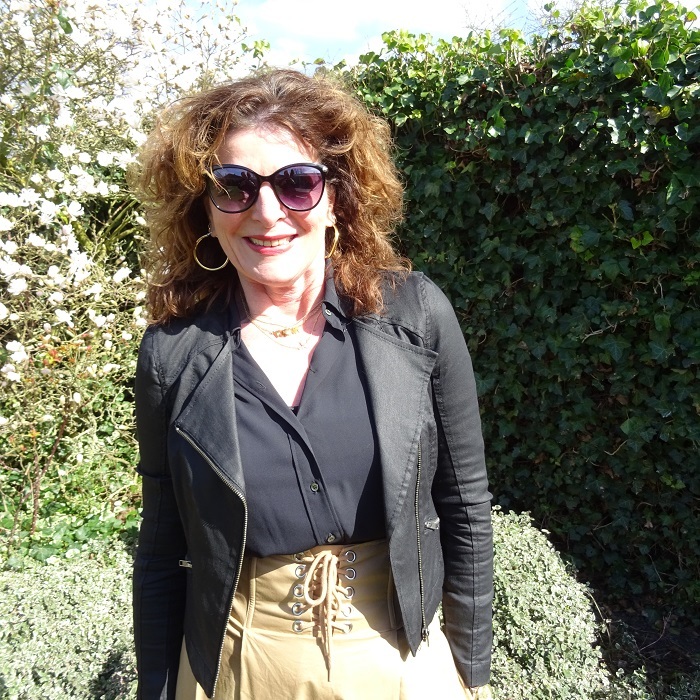 I wear the skirt with a simple black blouse, the blouse has fairly wide cuffs, and a biker jacket. The peep-toes are pretty old and dated, but I can’t say good-bye to them. I can’t enjoy that that long anymore, because they are really less beautiful now. I also have these in very light pink. Simple gold colored accessories, not as much as I wear here. And of course, as always, also during winter ladies!, red toe nails. Non polished toe nails look horrible to me, sorry, can’t help it. So again a outfit that I shopped in my closet. I do shop a lot less and try to think twice before I by. And when I buy something new, it is often pre loved( talk about new?) or from a good quality. Once in a while I let myself go by shopping at Primark for some trendy items that I know I only will like for one season. Are you more aware of what you buy as a few years ago? Thanks Lieske. It has been really lovely and sunny the last few days and today is sunny too but….the next days will be just very cold and even with frost at night and a chance on snow!!! What! Me too, but I let the pedicure take care of that! That skirt is fantastic on you Nancy! This is the perfect spring skirt! Love how you added edge with the jacket. I really love cotton skirts and and this one is so fabulous on you! I think that lace up detail really makes this fabulous….it’s so unique and fun. Hahaha, I tried too……I failed…. Jou staat het weer geweldig, maar ik zou hier te lomp in zijn door het veter gedeelte. Jij bent helemaal niet lomp! Love how you styled this beige skirt. IT looks amazing on you. Oh wow that skirt is amazing! You totally rocked it and I just love the lace up detail! The lace-up detail on the skirt is lovely and it has just the right amount of flair! The high waist skirt has the perfect design and looks great with the black of the jacket, the shoes and the whole set. Ha, ha. You’re description of high waisted jeans is funny. Really like the skirt with black, nice combination. 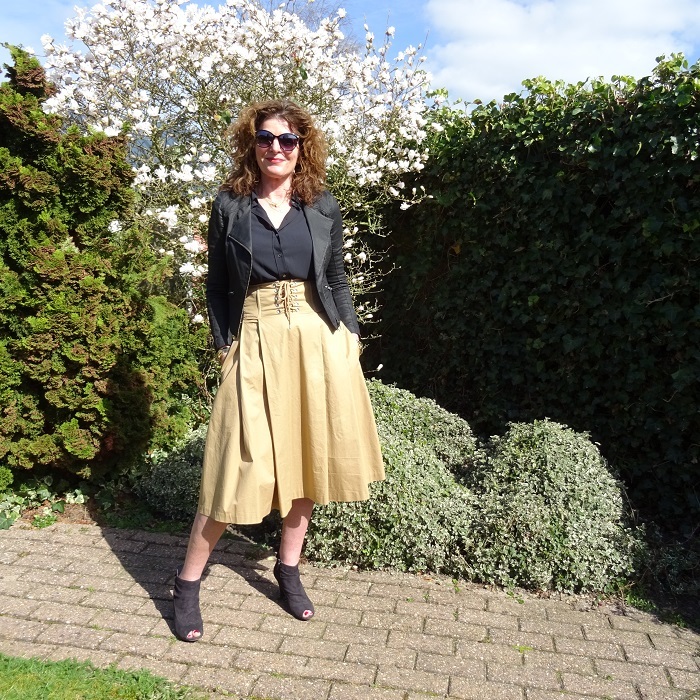 I’m not a fan of beige in general, but I do love the style of this skirt – pockets, yes! I like high waists on skirts and pants, but they can be harder to do with pants. Yes you are right. High waisted trousers are not my favorite to be honest. Love this skirt on you! Looks great with the black. Thanks! This one is from H&M! Simple, yet timeless and sassy. Love the classic color combination dear. This high waist skirt is so feminine. It makes the great hour glass figure. Love that. It seems that not only me as you had the most clicked style on My Red Carpet 14. Congratulations! Oh that is lovely! Thanks!